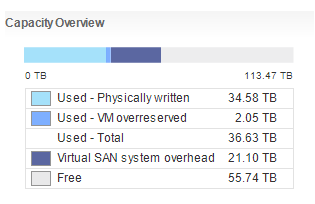 I had a 5-node VSAN with 100+ TB of hybrid storage, and it was FULL. I was kind of surprised because the application wasn’t heavy in use yet, but a new disk was added kept getting a vSphere error that it was running out of space and the VM would then crash. 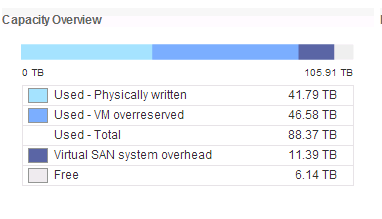 You can see here that I had a huge amount of “overreserved” due to the thick provisioning. I basically needed to re-apply the VSAN Default Policy, but unfortunately the SPBM Cmdlets didn’t work for my environment, they were throwing off index errors and whatnot. So I decided to try pyvmomi based on another post. Take a look at my other post about how to get pyvmomi setup on a RHEL 6 box. Unfortunately William’s examples since actually set the policy. They listed the storage policies and updated the storage policies. I found some other sample scripts and figured out that I needed to do a use a device spec, assign a profile to that and then assign that to a vm change spec and then pass that to the reconfigure vm method. It’s all in the script that you can find here. You also need the UUID of the VM (the -d param), which is NOT the MOREF or smbios.